Belly fat, also known as visceral fat, is considered the most harmful form of fat in your body. This type of fat has been linked with everything from insulin resistance, metabolic syndrome, heart disease, and type 2 diabetes to an increased risk for certain cancers. You may be surprised to find out that even if you’re relatively slim, you can still have a high percentage of body fat, particularly in your midsection. Also, if you’re overweight, you need to understand that belly fat truly is different from other fat that’s distributed to other areas of your body. In general, you need to work on reducing the fat all over your body, especially in your midsection, to decrease your risk of obesity-related diseases and disorders. Triglycerides: This type of fat circulates in your bloodstream. It makes up about 95 percent of the fat within your body. Subcutaneous fat: This fat is the layer that lies directly below the skin’s surface, between the skin and the abdominal wall. Visceral fat: Otherwise known as the dangerous belly fat, visceral fat is the kind located deep within your belly. Visceral fat hangs beneath the muscles in your stomach. This placement is what makes the fat so damaging to your health. Because this fat is so close to your internal organs, it becomes their best energy source. Think about it this way: If you could buy food from the corner store or the store clear across town, which would you pick? The nearby corner store, of course! Your body thinks in the same way. 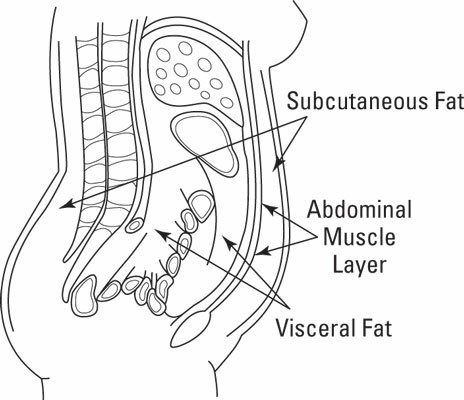 Why would it pull fat stores from subcutaneous fat in your arms if it can get energy right next door in your abdomen? The visceral fat provides a constant, steady stream of energy to your internal organs, which is where the major health risks lie. You’re probably wondering how you can tell what part of your belly is subcutaneous fat and what part is visceral fat. The subcutaneous fat is the outermost layer of fat; it’s the fat you can pinch between your fingers. This layer sits on top of the abdominal muscle tissue. Below the muscle tissue, where you can’t see with your eyes or pinch with your fingers, lays the visceral fat. As you can see in this figure, the visceral fat surrounds all the organs in the abdominal cavity. If you can pinch a good amount of subcutaneous fat, chances are you have a large amount of visceral fat lurking underneath your abdominal muscles. It was once thought that fat was just a passive substance; folks thought it just hung around as stored energy. But, in fact, fat is more active than first thought. The latest research shows that fat cells, including both subcutaneous and visceral fat cells, are metabolically active, secreting hormones and chemicals that can impact every organ in your body. When you’re at an ideal weight, the hormones and chemicals secreted by fat cells are actually healthy. They do a number of positive things, such as regulate insulin, help to regulate appetite by allowing you to feel satisfied after eating, and even help burn stored fat. The problem arises when you have more and larger fat cells than normal, which often occurs in an individual who’s overweight. These larger fat cells produce more hormones and chemicals than your body needs, which can impact your health over time and place you at risk for diseases like diabetes, stroke, heart attack, and even certain cancers. What makes visceral fat cells more dangerous than other fat cells is that they’re thought to produce an even greater amount of harmful chemicals, such as excessive hormones and toxins. And because this fat is so close to all your organs, especially the liver, it can be damaging to all your body’s systems. For example, here’s how this fat can affect your liver: After blood circulates through the visceral fat, it’s directly transported to the liver. The dangerous substances produced by the visceral fat are constantly being rapidly transported to your liver throughout the day (unlike subcutaneous fat stores in your legs and arms, which wait to be called on for energy before releasing fat stores and their byproducts). This increased fat processing in the liver can lead to the development of fatty liver disease and elevated LDL cholesterol levels (the “lousy,” or damaging cholesterol).